I am not a mathematician, but physics and maths are intimately entwined. I suspect I stumble on a deep philosophical question when I ponder whether maths exists that has no physical meaning. On a global scale I am moderately good at maths, I have two A levels* in the subject (maths and further maths), long years of training in physics have introduced me to a bit more. However, beyond this point I realised I was manipulating symbols to achieve correct results rather than really knowing what was going on. A lot of my work involves carry out calculations, but that’s not maths. I did intend decorating this post with equations, I didn’t in the end, wary of a couple of things: firstly the statement by Stephen Hawking that every equation would half sales; secondly I discovered that putting equations into Blogger is non-trivial. Equations, statements in mathematical notation are the core of maths and much of my journey in maths has been in translating equations into an internal language I understand. So here’s a pretty bit of maths, the Mandelbrot set, the amazing thing about the Mandelbrot set is how easy it is to generate such a complex structure. We can zoom into any part of the structure below and see more and more detail. Mathematics is the study of why such a thing is as it is, rather than just how to make such a thing. 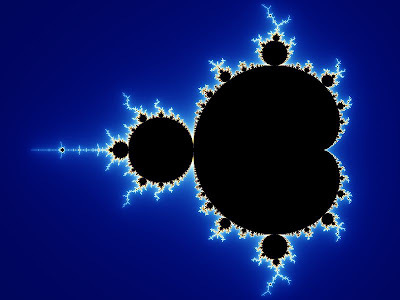 I remember playing with Mandelbrot sets as a child, before I understood complex numbers, to me they were a problem in programming and a source of wonder as I plunged ever deeper into a pattern that just kept developing. Have a look yourself with this applet… *time passes as I re-acquaint myself with an old friend*. There is something of this towards the end of Carl Sagan’s novel Contact, where the protagonists discover a message hidden deep within the digits of π.
I fiddle with numbers when I see them, and I suspect mathematicians do too. So my Girovend card showed 17.29 recently which, without the decimal place is 1729 = 13+123 = 103+93, the smallest number that has the property of being the sum of two different pairs of positive cubes, it’s also a very common piece of numerology. The numbering of the chapters of “The Curious Incident of the Dog in the Night-time” by Mark Haddon, with consecutive prime numbers also appeals to me. It’s become a tradition that I find ways to annoy the people I visit, and there’s no escape for mathematicians here. It seems like the best way is to annoy a mathematician is to assume they can do useful arithmetic, like a calculating a shared restaurant bill. Interestingly though, this may be a poor example, since fair division methods for important things, like cake, are an area of mathematical research. It’s true that some mathematicians are a bit odd, but then so are some physicists and to be honest if reality TV has taught us anything, it’s that the world is full of very odd people in every walk of life. So if you meet a mathematician, don’t be afraid! *A levels are the qualification for 18 year olds in the UK, when I was a student you would study for 3 or 4 A levels for 2 years. Update: Since writing this I’ve discovered a couple more interesting sites for fractals, and for want of a better place to put them I record them: here you can find a pretty rendering of the quaternion Julia set, and here is an in depth exploration of the Julia and Mandelbrot sets (1/1/10).